Bagpipe music like you've never heard it. 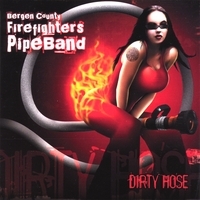 Dirty Hose contains the typical, traditional sets found on most pipeband CD's. However, the "highlights" on this CD are anything but traditional. The Bergen County Firefighter's Pipeband has been entertaining audiences around the globe since 1996. We have been seen live at parades and stage shows throughout the NY Metropolitan area and we mix it up regularly at local bar gigs. Our CD Dirty Hose has been sold around the world and we have received positive reviews from 5 continents. The band is a made up of volunteer firefighter's with a handful of civilians mixed in. Dirty Hose is the result of 9 months of recording, mixing and heavy drinking in an attempt to produce something not quite heard before. Even if you don't like bagpipes, you'll find something on this CD you'll enjoy. The award winning hit "The Rasta Piper", the swing version of "The Steam Train to Mallaig" or The Ramones classic "I Wanna Be Sedated" played on bagpipes are all fan favorites. If the music isn't to your liking, many people have bought "Dirty Hose' just for the cover design and liner notes and on top of all this your supporting volunteer firemen.